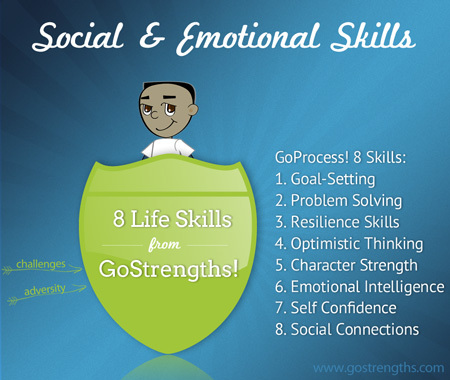 The GoStrengths! program teaches students 8 research-based social and emotional skills encapsulated by the acronym GoProcess! These skills include goal-setting, problem-solving, resilience, optimistic thinking, character strength development, emotional intelligence, self-confidence, and social skills. The program is made up of 10 online modules with built-in teacher training. Learn more below! What is well-being (and why should you care)? This module provides you with the foundational principles in the GoStrengths! course. Why do you do what you do? Understand why you have certain emotional reactions to challenges or difficult situations in life. Watch out for ThoughtHoles! Discover 8 common errors in thought, how they affect your resilience, and how you can fix them. The 5Cs: Catch, Check, Collect, Challenge & Change! Learn the 5C method to increase your resilience and overcome challenges. Superhero Problem-Solving! Practice the 6-step Superhero Problem-solving Process to solve any problem you may have. What is right with this picture? Uncover your greatest strengths and learn why they matter. Promote the process! Identify your fundamental beliefs about success and cultivate a growth mindset. Practicing happiness! Practice research-based methods to increase your optimism and happiness. Spinning a strong web! Strong social connections are vital to humanoid well-being. Learn the best ways to make and strengthen friendships. Humanoid flourishing! Learn how to effectively set short and long-term goals using the SCCAB model of goal-setting. See Details & Pricing for Professionals & Schools!